The O-Pipin-Na-Piwin Cree Nation have suffered generations of maltreatment at the hands of various official entities. 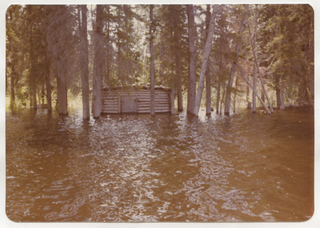 Moved from their homelands further south, they now occupy small scattered settlements in northern Manitoba, where summers are short and the land infertile. Having adapted to some extent to their new circumstances, large dams, built to supply energy to the rest of the province and beyond, flooded their traditional fishing and hunting grounds, destroying their livelihoods even further. Being so remote, the supply chain for outside foods is tenuous and expensive, with prices way beyond those found further south. No wonder, then, that the people are suffering an epidemic of malnutrition and its attendant diseases. But after years of maltreatment, the people are starting to reclaim their foodways and learning new ways to feed themselves sustainably. Andi Sharma, a policy analyst with the Northern Healthy Foods Initiative, told me about the problems and some of the incipient solutions. The banner image is part of a very early map of the area now occupied by the indigenous people and Manitoba Hydro. The Northern Healthy Foods Initiative is trying to improve food security in a variety of ways. I didn’t spend much time following up on Canada’s Truth and Reconciliation Commission, but I’m struck by the historical similarities between Canada and Australia, and, again, by the power of food as a political weapon.